Thomas Jefferson geschilderd door Rembrandt Peale in 1800. 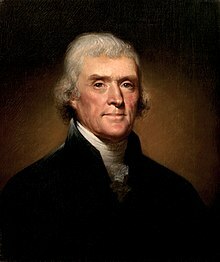 Thomas Jefferson (1743 – 1826) was Amerikaans staatsman, filosoof en kunstenaar en de derde President van de Verenigde Staten..
"We hold these truths to be self-evident, that all men are created equal; that they are endowed by their Creator with inherent and inalienable Rights; that among these, are Life, Liberty, and the pursuit of Happiness; that to secure these rights, Governments are instituted among Men, deriving their just powers from the consent of the governed; that whenever any Form of Government becomes destructive of these ends, it is the Right of the people to alter or abolish it, and to institute new Government, laying its foundation on such principles, and organizing its powers in such form, as to them shall seem most likely to effect their Safety and Happiness." Bron: Brief van Jefferson aan William Stephens Smith, 13 November 1787. Aanhaling(en): J Cavanaugh, De Storm, Uitgeverij Kok, 2007, ISBN 9789029718332, p. 345. Aanhaling(en): Feniks - overzicht van de geschiedenis, Thieme Meulenhoff, Proefhoofdstuk nieuwe editie Feniks tweede fase havo, ongedateerd. Analyse: Democracy is nothing more than mob rule..., Monticello.org.